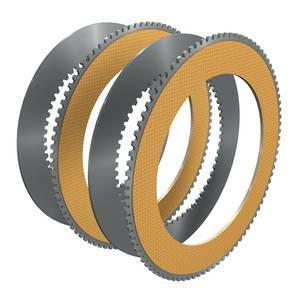 This product group includes all plate type friction components for clutches and brakes which possess driving teeth or lugs on their outer or inner diameters. Both plate and counterplate must be considered together, in general one plate with friction material works together with a counterplate of steel or cast iron. The plates are the important functional element in every clutch and brake, and have been developed in many different ways since the early days of clutches and brakes. Ortlinghaus has played an important role in the total development of friction clutches, one example of its contributions being the patented, well known, sprung steel plate, known world-wide under the trademark “Sinus”. The use for the first time of sintered plates in clutches, was also an important development. In the course of this development every relevant technological step forward – whether in frictional material, mechanical or heat treatment process – has been applied directly to the manufacture of the plates. As a result Ortlinghaus plates today contain the results of nearly one hundred years of research and development and represent a highly specialised component. Supported by the experience gained over this long period of time, Ortlinghaus is today, able to provide a very comprehensive range of clutch and brake plates in a multitude of different dimensions, friction combinations and surface patterns. The number of standard plates listed in our catalogue is large and most of these are available ex stock, satisfying most of our customer requirement from this well proven range. Our customers benefit from quick availability and a good price arrived at from volume production. Should it not be possible to solve a particular design problem with these plates, as listed in our catalogue, we are always ready to manufacture plates to meet specific customer wishes. In this area too our experience is extensive, every requirement can be satisfied with the aid of the most modern manufacturing techniques. The main characteristic features of the different types of plates are described in the following sections in order to make clear the variety and to aid customers in making the correct choice. In every multi-plate clutch and brake there are inner plates, which are driven on the inner diameter together with a hub, and outer plates, which are driven on the outer diameter together with a housing. Both the inner or outer plates can be the driver or driven sides, and both can carry the friction lining, this depends on the type of clutch or brake and the conditions in which they are to be used. Plates must be mounted with other drive components, i.e. hub or housing, in such a way that they can be easily displaced axially but are held so that they cannot rotate. Different forms of drive locations are available to fulfill the above purpose: – lugs and slots, – spline in accordance with DIN 867 and DIN 5480 as well as other standards, – holes in the plate for studs, – special shapes in accordance with customer requirements. Generally dry-running clutches and brakes use a pair of plates consisting of “organic” friction lining on one plate and a counterplate of steel or special cast iron. Although this friction combination is subject to wear, it has become a standard due to its hard wearing capabilities. Sintered, metallic friction linings are also used for particular applications. The friction linings described here are riveted or bonded to the plates in the form of rings or segments or are applied by a sintering process. When considering “wet-running” plates, it is necessary to consider the lubricating and cooling oil, since this plays a decisive roll in the frictional process. In wet-running clutches and brakes the “classical” friction combination of steel/steel is today being replaced more and more by steel/sintered coating. The standard qualities of sintered coating are able to cover a wide range of conditions which are placed on high performance friction linings. In addition, the sinter is capable of being varied in terms of composition porosity and compatibility with oil enabling it to fulfill a wide range of special tasks. Of special interest within the range of wetrunning plates is the friction combination steel/paper lining. This is being used to an ever greater extent in transmission systems in general mechanical engineering and in the motor vehicle industry. This is due to its extraordinary frictional behaviour and its almost total freedom from wear. This brief summary of the wide variety of different plates clearly shows that the advice of experienced specialists should always be sought if the best friction combination is to be selected for the particular application in question.